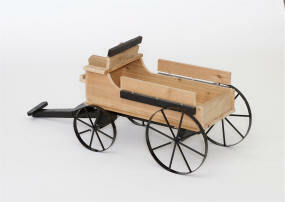 The Large Rustic Hitch Wagon is made with 3/4" thick red cedar. 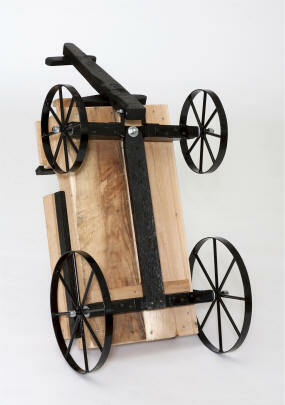 The wheel spokes are made with Hickory wood and the wheel rim and hub are cast aluminum. Great for indoor and outdoor decorating. 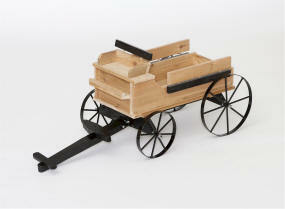 Note: This Large Rustic Hitch Wagon is not intended to be pulled by animals - For decorative purposes only. Shipslor="#000000" in kit form. Easy to assemble with your wrenches, hammer, and screwdrivers. See Pictures Below. Bed Size..... 48" x 22"
Wheel Size Diameter Front..... 24"
Wheel Size Diameter Rear...... 28"
Height: Ground to top of seat...42.5"
Choose either natural or painted black wheels. Specify your choice in the comment box that appears during the checkout process.